Cherry Bomb from Bomb Seeds are feminised cannabis seeds from good quality. This nice weed strain is originated by crossing the Big Bomb with a unique fruity mother plant. Bomb Seeds Cherry Bomb is an ideal weed plant for those who are looking for a large yield per plant, it also has a high smoke quality. 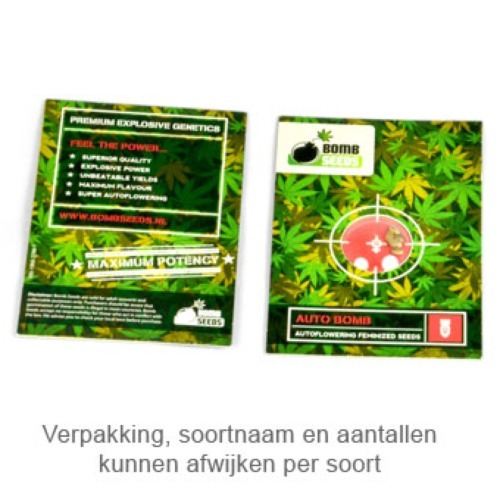 These feminised cannabis seeds are suitable for an indoor grow and outdoor grow. Growing cannabis from these weed seeds provide you a delicious weed! The effect of smoking this weed starts with a calm feeling in your head. This feeling overflows in a physical relaxed feeling, but without a knock out feeling. The taste of this weed is fruity with a sweet cherry taste. You can think of summer fruit with a skunk element. Tell us and our customers what you think of the Cherry Bomb from Bomb Seeds.